Bridge Battle is played on a 12'x12' square field. Two alliances - one "red" and one "blue" - composed of two teams each, compete in a match. Matches consist of a twenty-second autonomous period followed by two minutes of driver-controlled play. The object of the game is to attain a higher score than your opponent alliance by placing tennis balls and bonus balls into goals. 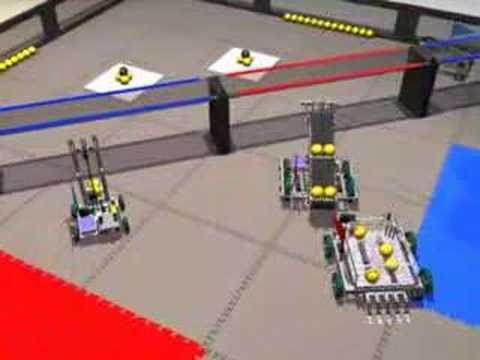 In addition, an alliance can earn additional points by "parking" robots on either of the two platforms. A bonus is awarded to the alliance that has the most total points at the end of the Autonomous Period. After two successful seasons in FVC, FIRST changed the format of the program and renamed it the FIRST Tech Challenge providing us with the new number Team 339. Coming off two impressive VEX seasons, Simbotics’ goal for the year was to continue their success. Team 339 produced Simbot “Scorpion”. After winning the Ontario FTC Championship, Simbotics qualified for the World Championships in Atlanta, Georgia once more. After great qualifying rounds, Team 339 finished the Championships as semi-finalists.